Greg Strommen of Fargo demonstrates the snowmobile safety simulator that will be on hand at SnowJam 2011. 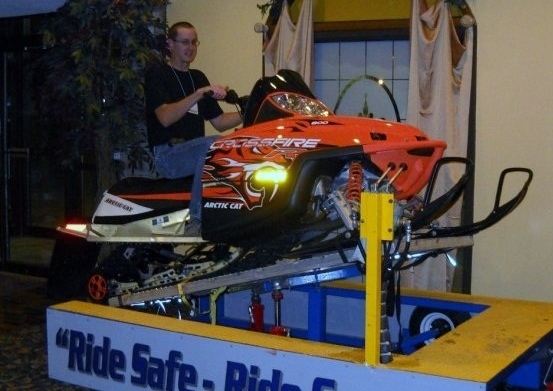 The simulator, which is owned by Snowmobile North Dakota and North Dakota Park and Rec, helps riders learn how to balance on a snowmobile as it goes over varying terrain. Anyone will be able to try it out on Saturday, Jan. 22 at Hagge’s Bar and Grill in Mapleton. SnowJam 2011, hosted by Rural Cass Snowmobile Club, an affiliate of East Central Valley Trail Association, is the area’s premier snowmobile trail ride and vintage snowmobile show. You won’t want to miss it!